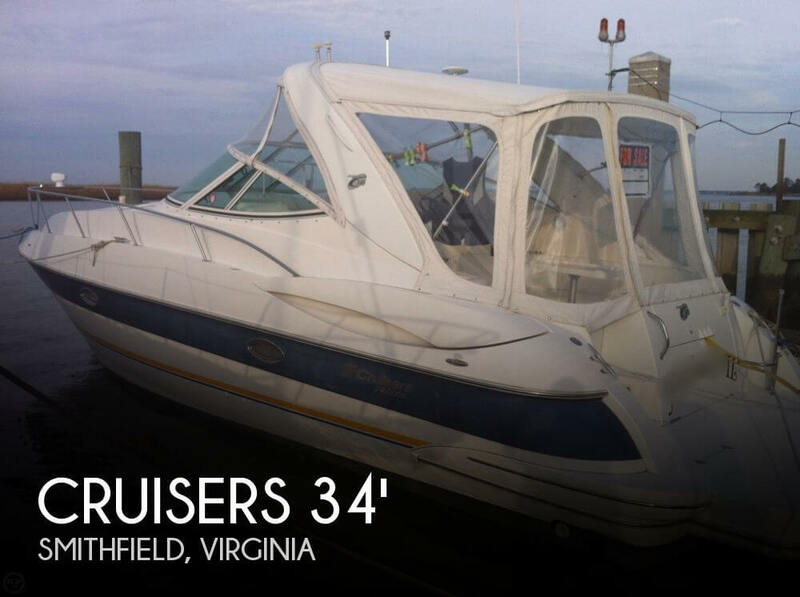 BOASTING ALL OF THE MOST SOUGHT AFTER OPTIONS, PRIDE OF OWNERSHIP SHOWS IN THIS 2000 CRUISERS 3870 EXPRESS -- PLEASE SEE FULL SPECS FOR COMPLETE LISTING DETAILS. 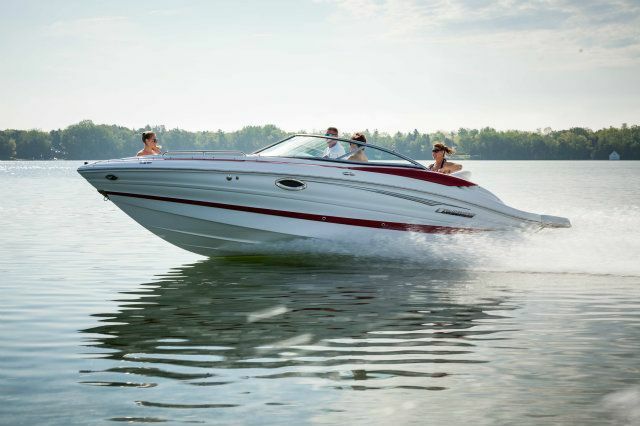 Freshwater / Great Lakes boat since new this vessel features Twin MerCruiser 454-Magnum Horizon 380-hp Gas Engine's with460 original hours. 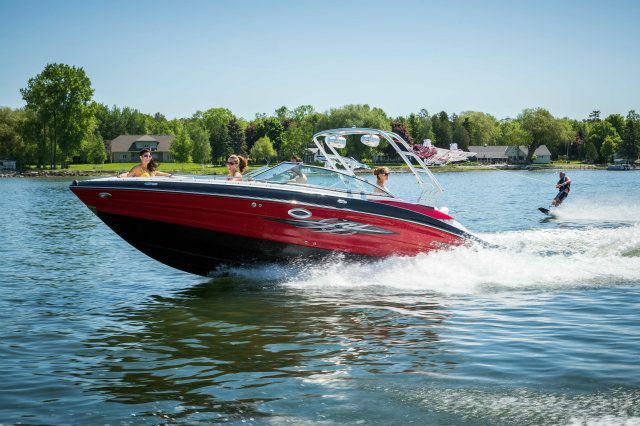 Notable features include but are not limited to the following: Air-Conditioning & Heat (2-Units), (2) Heads (Vacuflush) w/Vanity/Sink/Shower's (Note Stall-Shower in Main Head), Central Vacuum System, Kohler Generator, Windlass Anchor, Raymarine Electronics Package (ST-60 Tri-Data w/Depth/Speed/Trip-Log, RL80C Radar w/Radar/GPS/Chartplotter, Autopilot), Cockpit Wet Bar w/Sink/Refrigerator, Full Camper-Top Canvas Package wLexan Forward Windshield Glass/Strata-Glass/Screens, Large Extended Deck Swim Platform, and MUCH more! 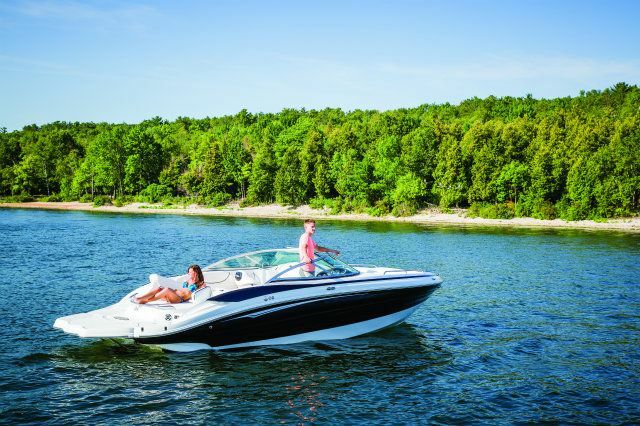 Good-looking express introduced in 1997 offered upmarket mix of style, luxury, performance. Spacious interior with two heads, full-service galley features unique amidships stateroom with stand-up dressing area, built-in TV, private head with shower. Cockpit has L-lounge opposite helm, wet bar, U-shaped seating aft. Note walk-through windshield, easy-access engine compartment. Extended swim platform supports dinghy, PWC. 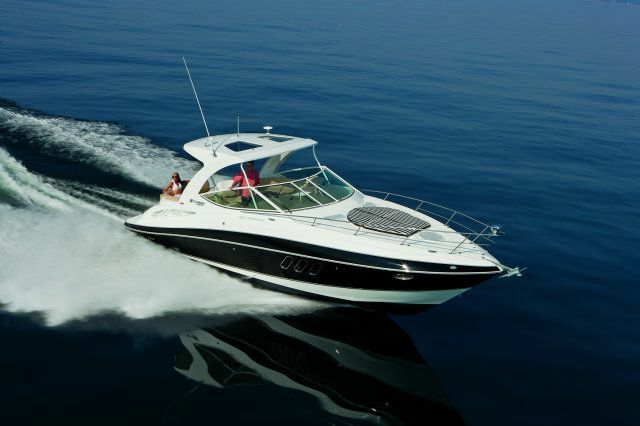 Twin 380hp gas V-drive inboards cruise at 20 knots (about 30 knots top). 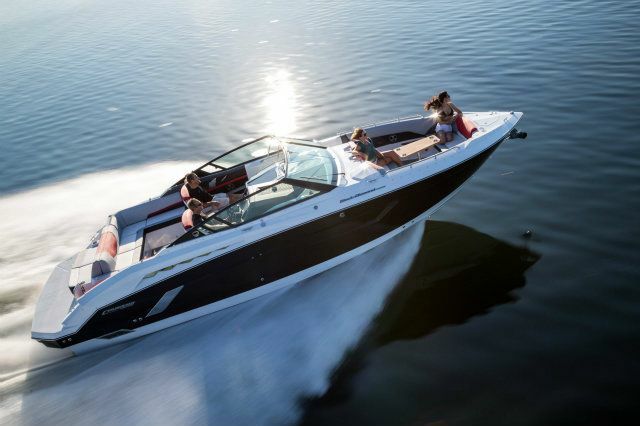 Manufacturer Provided Description The Cruisers 3870 Express has an open living space featuring a crescent-shaped, convertible sofa and a fully equipped galley. The forward island berth can be made into a separate stateroom with a privacy curtain or the optional bulkhead and door. The elegantly designed helm station ensures the captain is well informed of all boat and engine functions while underway. 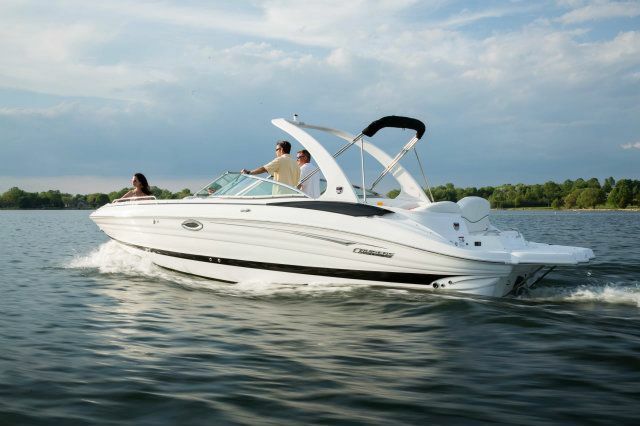 With a large refrigerator and freezer, microwave oven, double-burner electric stove, the 3870 boasts all the amenities needed for comfortable liveaboard cruising. The main head offers full standing headroom and a large, separate, standup shower for additional comfort and ease of movement. 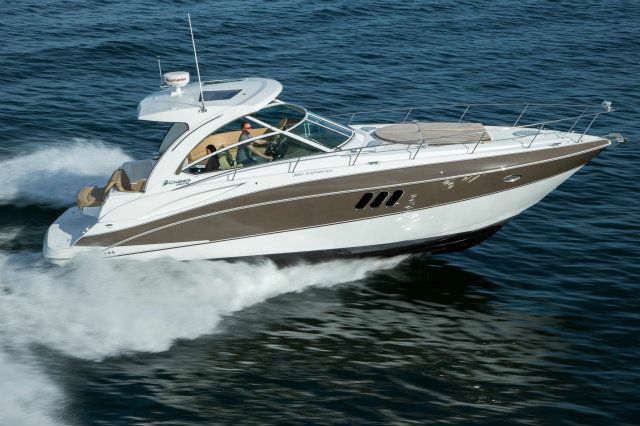 Like her sister ship, the 4270 Express, the 3870 features a unique second cabin amidships. This stateroom includes twin berths that can be converted to a king-size bed with a self-storing filler cushion. The 3870's second-cabin suite includes a changing area with full standing headroom and a private head with a shower, all conveniently located behind a bulkhead door for maximum privacy.